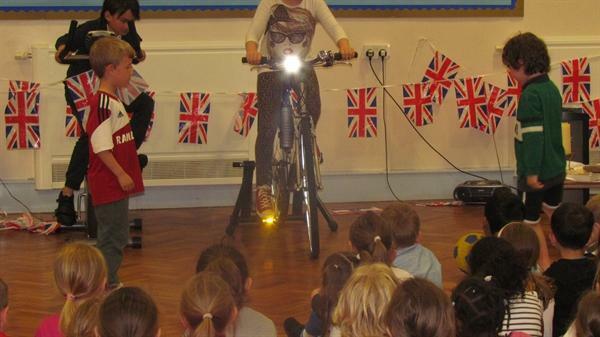 As part of our healthy week celebrations the whole school joined together in assembly today. 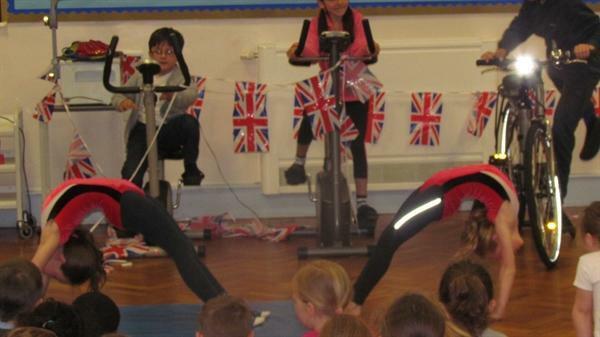 Two children from each class shared with the rest of the school activities they do to keep themselves fit and healthy when they are not at school. 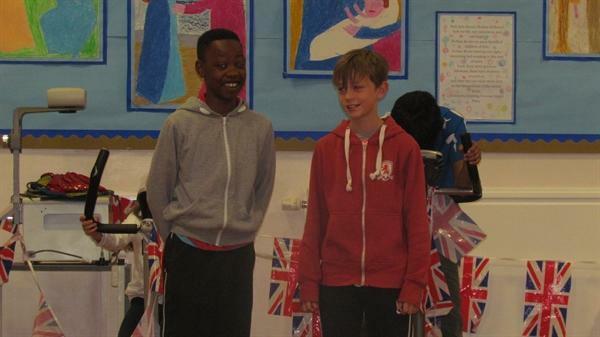 Frankie and Dion from Year 6 kicked off and shared their footballing skills and knowledge. 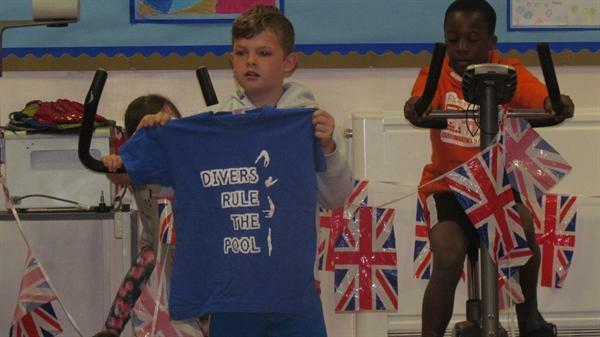 Rylan from Year 5 shared his love for diving and had Dion from Year 6 and Kimberley from Reception helping him out performing pike shapes. Sarah from Year 5 enjoys horseriding to keep fit and showed her rosettes and trophy to everyone. 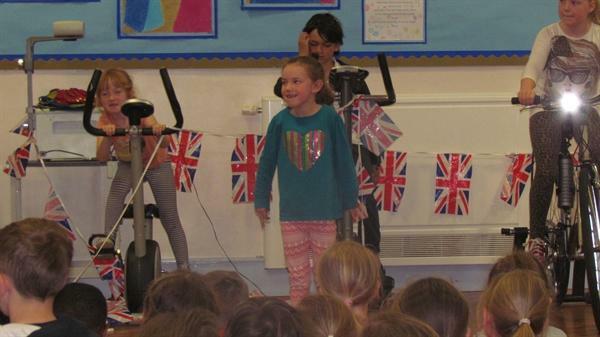 Izzy in Year 4 is a force to be reckoned with!! She explained how she stays strong and focused whilst carrying out her martial arts. 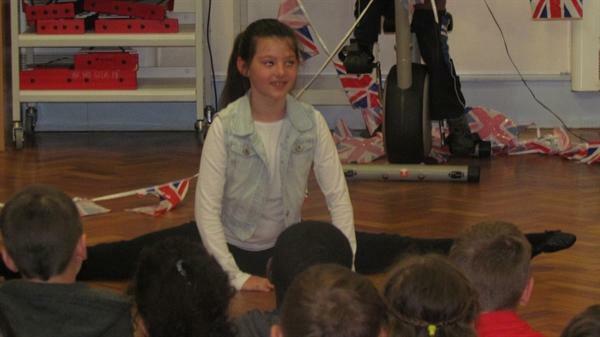 Isabel in Year 4 dances 4 times a week and demonstrated to everyone how flexible she is by doing the splits. Mrs Mercer was tempted to try and join her but then changed her mind! Niamh and Olivia in Year 3 swim, dance and take part in Irish dancing every week. 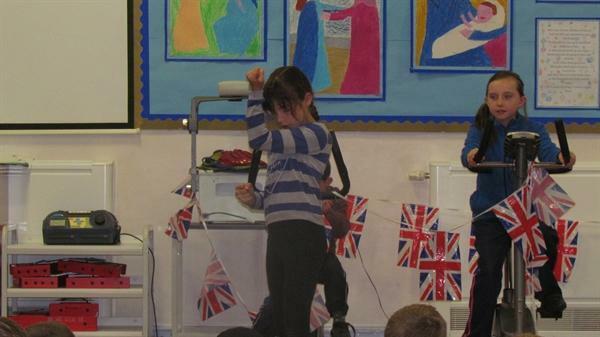 They performed some Irish dancing for the school followed by a gymnastic routine they had choreographed themselves. 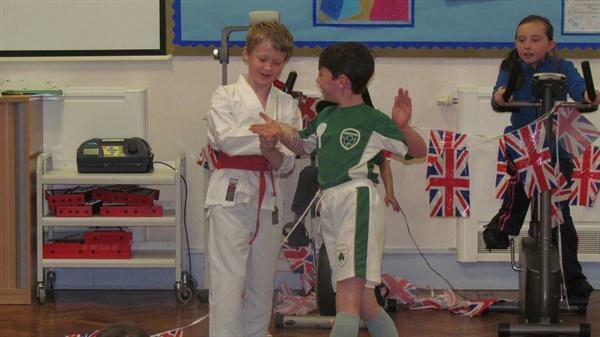 Joshua in Year 3 demonstrated his karate moves on Cormac. 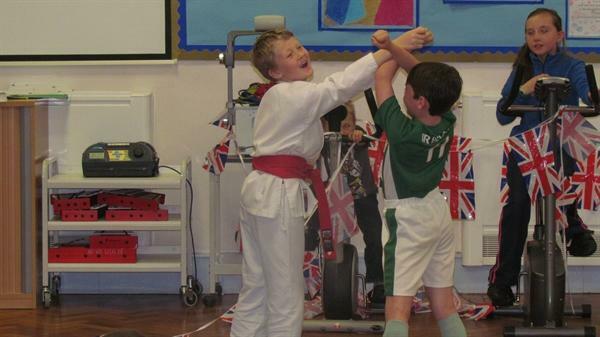 Joshua explained how he enjoys karate as it keeps him safe, flexible and fit. 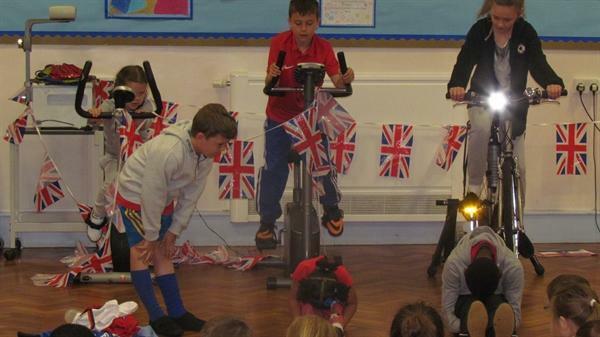 Year 2 showed how busy they have been this week making their Tour de St Paul's bunting with bicycles and patterned jerseys. It looks wonderful in the KS1 corridor. 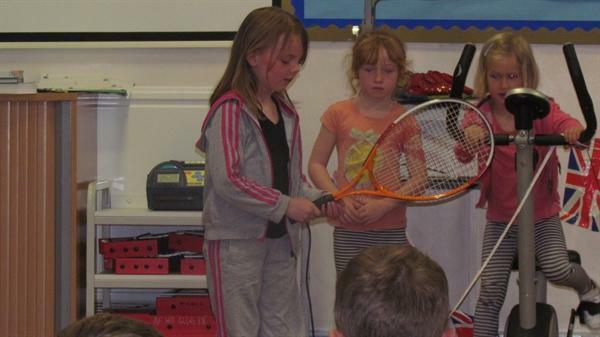 Madeline from Year 2 gave a quick lesson on the perfect forehand and backhand in tennis. Tom and Josef in Year 1 dribbled for everyone and are proud to be part of Wigton Moor's football team. 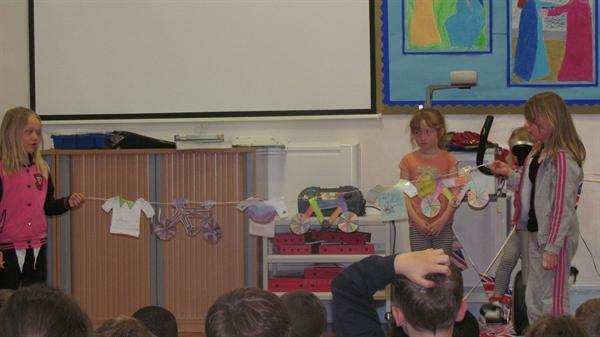 Freya in Year 1 told everyone how her hobby is swimming. She enjoys jumping off the diving board and swimming to the deep end. 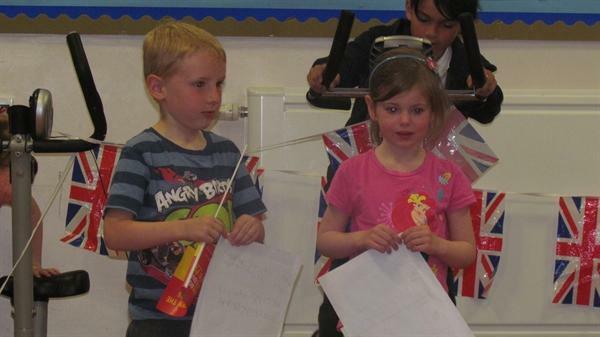 Finally Joseph and Emily from Reception class explained what they have been learning during healthy week. How many times can you take your shoes off and put them back on in a minute? Joseph can do it 40 times! Mrs Mercer challenged the whole school to see how many times they could sing Humpty Dumpty in a minute...and the answer was 8. 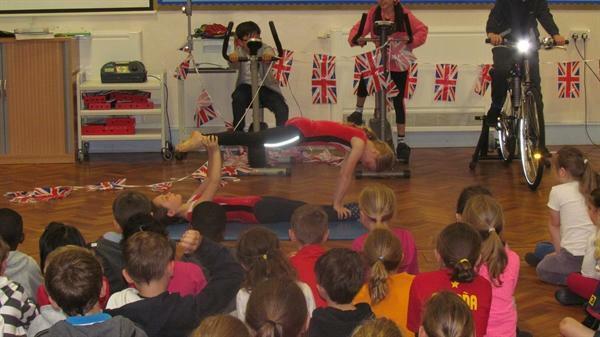 The big question is have you now been inspired to try something new to stay fit and healthy? Go on, give it a go.